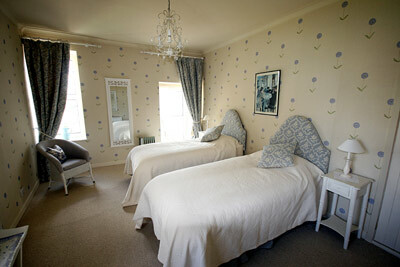 The rooms at Calico House provide the highest standard in bed and breakfast accommodation. The rooms are en-suite and tea and coffee facilities are provided. The bedrooms are quiet, being at the rear of the building, and regular up grades provide a fresh and pleasing feel to each room. Great care is taken to ensure that your stay is an enjoyable experience. 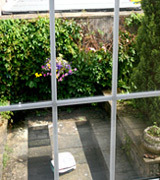 The Breakfast Room overlooks the outside courtyard garden, where breakfast can be had al-fresco, weather permitting.. The outlook from the rear windows in the Blue Room is exceptional, looking out over the top of the slated roofs of Coldstream towards Cheviot, the highest point in the wonderful Cheviot hills ( see view ).The accommodation comprises twin beds, en-suite bathroom with shower, televison and tea/coffee facilities. The room has a lovely open aspect and is a pleasure to be in. 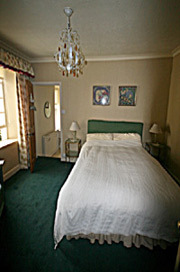 The Green Room offers double bed accommodation with en-suite facilities. The view from the window is over the garden courtyard and, like the Blue Room, being at the rear of the building it is quiet. 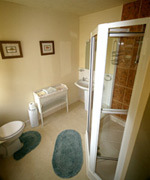 The accommodation comprises double bed, en-suite bathroom with shower, televison and tea/coffee facilities. A warm welcome awaits you at Calico House Bed & Breakfast. Please contact Geoff and Marion Williams for availability Contact Now all enquiries are welcome and we hope to see you soon in the wonderful Scottish Borders on the banks of the mighty River Tweed. The motto of the town of Coldstream is "Nulli Secundus" latin for "Second to none" we want your experience at Calico House Bed & Breakfast to reflect this.